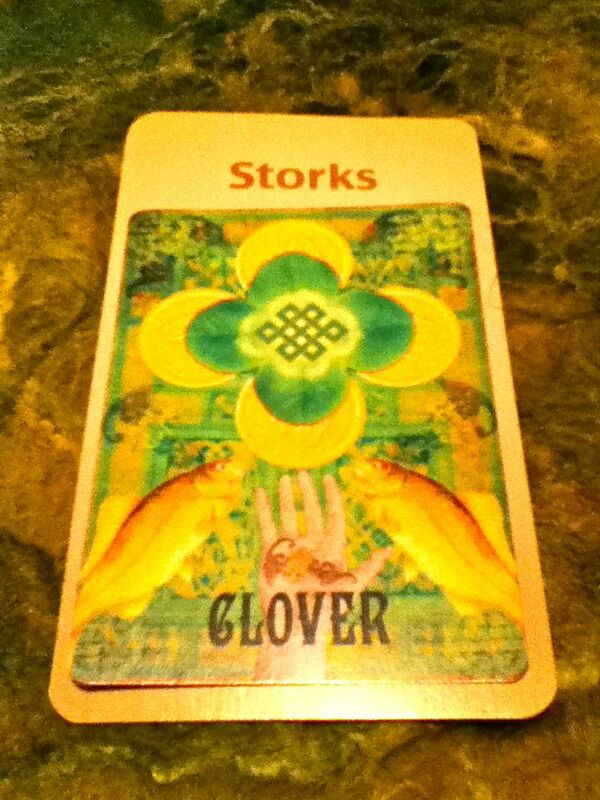 Today's Draw: Clover in the House of Stork from Les Vieux Jours Lenormand and the Deck of Lenormand Houses. Have you ever firmly and most assuredly stated a point only to discover you may be wrong? Did you admit your inaccuracy to all involved...even go so far as to blog about it? What do you believe about luck? Pardon me while I personify my oracle cards, but today is a good example of how snarky the cards can be when they want to be. So yesterday we had a combo that could mean "the end of luck" and I waxed all philosophic about how luck isn't some type of magic that is bestowed upon you. It's something you make. Then my digital camera broke, I smashed one of my favorite pieces of pottery (a wall piece), a vendor who was supposed to refund money didn't and I completely forgot to call a client that I PROMISED I'd call TODAY. Gah. And so now we get Clover (which we all know by now is "luck") in the House of Stork, the house of birth and, get this, happy returns. So after I all but poo-pooed the ending of luck and then had what some might consider an unlucky day, today we get a combo that speaks of luck returning to the nest. So I could go on and on about how happenings like this help us develop good trust and communication with our cards. And how this is a happy event, because my rapport with the Lenormand turned a corner today. And all of that is stuff I believe. But I also believe the power isn't in the cards, it's within. Which means this is my own way of telling myself, "your attitude got too big for its britches yesterday, Tierney." I suppose we all need to be reigned in now and again. And I did kind of unnecessarily mock the leprechauns and fairies yesterday. I still believe luck is made, though. Very strongly. But maybe there's a little something to this fairy dust thing after all. Just a little. Anyone else have a similar hard-luck day?